"Trackless trolley" redirects here. For the non-electric buses that resemble historic streetcars, see Tourist trolley. A trolleybus (also known as trolley bus, trolley coach, trackless trolley, trackless tram [in early years] or trolley) is an electric bus that draws power from overhead wires (generally suspended from roadside posts) using spring-loaded trolley poles. Two wires and poles are required to complete the electrical circuit. This differs from a tram or streetcar, which normally uses the track as the return path, needing only one wire and one pole (or pantograph). They are also distinct from other kinds of electric buses, which usually rely on batteries. Power is most commonly supplied as 600-volt direct current, but there are exceptions. Currently, around 300 trolleybus systems are in operation, in cities and towns in 43 countries. Altogether, more than 800 trolleybus systems have existed, but not more than about 400 concurrently. 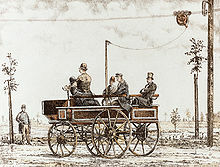 The trolleybus dates back to 29 April 1882, when Dr. Ernst Werner Siemens demonstrated his "Elektromote" in a Berlin suburb. This experiment continued until 13 June 1882, after which there were few developments in Europe, although separate experiments were conducted in the U.S. In 1899, another vehicle which could run either on or off rails was demonstrated in Berlin. The next development was when Lombard Gerin operated an experimental line at the Paris Exhibition of 1900 after four years of trials, with a circular route around Lake Daumesnil that carried passengers. Routes followed in 6 places including Eberswalde and Fontainebleau. Max Schiemann on 10 July 1901 opened the world's fourth passenger-carrying trolleybus system, which operated at Bielatal (Biela Valley, near Dresden), in Germany. Schiemann built and operated the Bielatal system, and is credited with developing the under-running trolley current collection system, with two horizontally parallel overhead wires and rigid trolleypoles spring-loaded to hold them up to the wires. Although this system operated only until 1904, Schiemann had developed what is now the standard trolleybus current collection system. In the early days there were many other methods of current collection. The Cédès-Stoll (Mercédès-Électrique-Stoll) system was first operated near Dresden between 1902 and 1904, and 18 systems followed. The Lloyd-Köhler or Bremen system was tried out in Bremen with 5 further installations, and the Cantono Frigerio system was used in Italy. Throughout the period, trackless freight systems and electric canal boats were also built. Leeds and Bradford became the first cities to put trolleybuses into service in Great Britain on 20 June 1911. Apparently, though it was opened on 20 June, the public was not admitted to the Bradford route until the 24th. Bradford was also the last to operate trolleybuses in the UK, the system closing on 26 March 1972. The last rear-entrance trolleybus in Britain was also in Bradford and is now owned by the Bradford Trolleybus Association. Birmingham was the first to replace a tram route with trolleybuses, while Wolverhampton, under the direction of Charles Owen Silvers, became world-famous for its trolleybus designs. There were 50 trolleybus systems in the UK, London's being the largest. By the time trolleybuses arrived in Britain in 1911, the Schiemann system was well established and was the most common, although the Cédès-Stoll (Mercédès-Électrique-Stoll) system was tried in West Ham (in 1912) and in Keighley (in 1913). Smaller trackless trolley systems were built in the US early as well. The first non-experimental system was a seasonal municipal line installed near Nantasket Beach in 1904; the first year-round commercial line was built to open a hilly property to development just outside Los Angeles in 1910. The trackless trolley was often seen as an interim step, leading to streetcars. In the U.S.A., some systems subscribed to the all-four concept of using buses, trolleybuses, streetcars (trams, trolleys) and rapid transit subway and/or elevated lines (metros), as appropriate, for routes ranging from the lightly used to the heaviest trunk line. Buses and trolleybuses in particular were seen as entry systems that could later be upgraded to rail as appropriate. In a similar fashion, many cities in Britain originally viewed trolleybus routes as extensions to tram (streetcar) routes where the cost of constructing or restoring track could not be justified at the time, though this attitude changed markedly (to viewing them as outright replacements for tram routes) in the years after 1918. Trackless trolleys were the dominant form of new post-war electric traction, with extensive systems in among others, Los Angeles, Chicago, Rhode Island, and Atlanta; Boston|, San Francisco, and Philadelphia still maintain an "all-four" fleet. Some trolleybus lines in the United States (and in Britain, as noted above) came into existence when a trolley or tram route did not have sufficient ridership to warrant track maintenance or reconstruction. In a similar manner, a proposed tram scheme in Leeds, United Kingdom, was changed to a trolleybus scheme to cut costs. Trolleybuses are used extensively in large European cities, such as Athens, Belgrade, Bratislava, Bucharest, Budapest, Chisinau, Kiev, Lyon, Milan, Minsk, Moscow, Riga, Saint Petersburg, Sofia, Tallinn, Varna, Vilnius and Zurich, as well as smaller ones such as Arnhem, Bergen, Coimbra, Gdynia, Kaunas, Lausanne, Limoges, Luzern, Modena, Piatra Neamț, Plzeň, Prešov, Salzburg, Solingen, Szeged, Târgu Jiu and Yalta. See also Trolleybus usage by country. Transit authorities in some cities have reduced or discontinued their use of trolleybuses in recent years, while others, wanting to add or expand use of zero-emission vehicles in an urban environment, have opened new systems or are planning new systems. For example, new systems opened in Lecce, Italy, in 2012 and in Malatya, Turkey, in 2015. Diagram of a 1947-built Pullman Standard model 800 trolleybus, a type still running in Valparaíso (Chile). Cheaper infrastructure - The initial start up cost of trams is much higher, due to rail, signals, and other infrastructure. Trolleybuses can pull over to the curb like other buses, eliminating the need of special boarding stations or boarding islands in the middle of the street, thus stations can be moved as needed. Better hill climbing - Trolleybuses' rubber tires have better adhesion than trams' steel wheels on steel rails, giving them better hill-climbing capability and braking. Easier traffic avoidance - Unlike trams (where side tracks are often unavailable), an out-of-service vehicle can be moved to the side of the road and its trolley poles lowered. The ability to drive a substantial distance from the power wires allows trackless vehicles to avoid obstacles, although it also means a possibility that the vehicle may steer or skid far enough that the trolley pole can no longer reach the wire, stranding the vehicle. Trackless trolleys also are able to avoid collisions by maneuver, while trams can only change speed. Quietness - Trolleybuses are generally quieter than trams. Easier training - The control of trolleybuses is relatively similar to motorbuses; the potential operator pool for all buses is much larger than for trams. Better hill climbing - Trolleybuses are better than motorbuses on hilly routes, as electric motors provide much higher static torque at start-up, an advantage for climbing steep hills. Unlike internal combustion engines, electric motors draw power from a central plant and can be overloaded for short periods without damage. 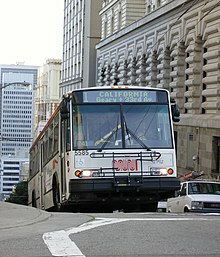 San Francisco and Seattle, both hilly American cities, use trolleybuses partly for this reason. Given their acceleration and braking performance, trolleybuses can outperform diesel buses on flat stretches as well, which makes them better for routes that have frequent stops. Environmentally friendly - Trolleybuses are usually more environmentally friendly in the city than fossil fuel or hydrocarbon-based vehicles (petrol/gasoline, diesel, alcohol, etc.). Power from a centralized plant, even taking into account transmission losses, is often produced more efficiently, is not bound to a specific fuel source, and is more amenable to pollution control as a point source, unlike individual vehicles with exhaust gases and particulates at street level. Trolleybuses are especially favoured where electricity is abundant, cheap, and renewable, such as hydroelectric. Systems in Seattle and in Vancouver, BC, draw hydroelectric power from the Columbia River and other Pacific river systems. San Francisco operates its system using hydro power from the city-owned Hetch Hetchy generating plant. Trolleybuses can generate electricity from kinetic energy while braking, a process known as regenerative braking. For regenerative braking to function, there must be another bus on the same circuit needing power, an electric storage system on the vehicle or the wire system, or a method to send the excess power back to the commercial electric power system. Otherwise the braking energy must be dissipated in resistance grids on the bus; this is called "dynamic braking". For routes that have more frequent stops, the use of trolley buses eliminates pollution during idling, thus improving air quality. Minimal noise pollution - Unlike trams or gasoline and diesel buses, trolleybuses are almost silent, lacking the noise of an engine or wheels on rails. Most noise comes from auxiliary systems such as power steering pumps and air conditioning. Early trolleybuses without these systems were even quieter and, in the UK at least, were often referred to as the "Silent Service". This however can also be seen as a disadvantage, with some pedestrians falling victim to what was known as "Silent Death" (in Britain) or "Whispering Death" (in Australia). Usable in enclosed space - The lack of exhaust allow trolleybuses to operate underground. In Cambridge, Massachusetts, trackless trolleys survived because Harvard Station, where several bus lines terminate, is in a tunnel once used by streetcars. Although diesel buses do use the tunnel, there are limitations due to exhaust fumes. Also, the trackless trolleys continue to have popular support. The only trolleybus systems in Japan, the Tateyama Tunnel Trolleybus and Kanden Tunnel Trolleybus lines, both run in tunnels serving the Kurobe Dam and Tateyama Kurobe Alpine Route, and were converted from normal diesel buses specifically for their lack of exhaust. Longevity and maintenance - Electric motors typically last longer than internal combustion motors, and cause less secondary damage from vibration, so electric buses tend to be very long-lived compared to motorbuses. As the basic construction of buses has not changed much in the last 50 plus years, they can be upgraded such as when air conditioning was retrofitted to many trolleybuses. Such upgrades are often disproportionately expensive. Wheelchair lifts are relatively simple to add; kneeling front suspension is a common feature of air suspension on the front axle in lieu of springs. 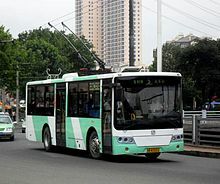 In comparison to battery-powered buses, the lack of a specially designed battery or fuel cell (typically with expensive patents) decreases the price and weight, and in locations with a sufficient power delivery network, the trolleybus is cheaper and easier to maintain in comparison to charging stations[dubious – discuss]. Note: As there are numerous variations of tram and light-rail technology, the disadvantages listed may be applicable only with a specific technology or design. More control required - Trolleybuses must be driven like motorbuses, requiring directional control by the driver. Higher rolling resistance - Rubber-tired vehicles generally have more rolling resistance than steel wheels, which decreases energy efficiency. Less efficient use of right-of-way - Lanes must be wider for unguided buses than for streetcars, since unguided buses can drift side-to-side. The use of guidance rail allows trams running in parallel lanes to pass closer together than drivers could safely steer. Difficulties with platform loading - Implementation of level platform loading with minimal gap, either at design stage or afterwards, is easier and cheaper to implement with rail vehicles. Difficult to re-route - When compared to motorbuses, trolleybuses have greater difficulties with temporary or permanent re-routings, wiring for which is not usually readily available outside of downtown areas where the buses may be re-routed via adjacent business area streets where other trolleybus routes operate. This problem was highlighted in Vancouver in July 2008, when an explosion closed several roads in the city's downtown core. Because of the closure, trolleys were forced to detour several kilometers off their route in order to stay on the wires, leaving major portions of their routes not in service and off-schedule. Aesthetics - The jumble of overhead wires may be seen as unsightly. Intersections often have a "webbed ceiling" appearance, due to multiple crossing and converging sets of trolley wires. Dewirements — Trolley poles sometimes come off of the wire. Dewirements are relatively rare in modern systems with well-maintained overhead wires, hangers, fittings and contact shoes. Trolleybuses are equipped with special insulated pole ropes which drivers use to reconnect the trolley poles with the overhead wires. When approaching switches, trolleybuses usually must decelerate in order to avoid dewiring, and this deceleration can potentially add slightly to traffic congestion. Unable to overtake other trolleybuses - Trolleybuses cannot overtake one another in regular service unless two separate sets of wires with a switch are provided or the vehicles are equipped with off-wire capability, with the latter an increasingly common feature of new trolleybuses. Higher capital cost of equipment - Trolleybuses are often long-lived equipment, with limited market demand. This generally leads to higher prices relative to internal combustion buses. The long equipment life may also complicate upgrades. More training required - Drivers must learn how to prevent dewiring, slowing down at turns and through switches in the overhead wire system, for example. Overhead Wires Create Obstruction - Trolleybus systems employ overhead wires above the roads used by the trolleybuses. The wires can restrict tall motor vehicles such as delivery trucks ("lorries") and double decker buses from using or crossing roads fitted with overhead wires, as such vehicles would hit the wires or pass dangerously close to them, risking damage and dangerous electrical faults. The wires also may impede positioning of overhead signage and create a hazard to activities such as road repairs using tall excavators or piling rigs, use of scaffolding, etc. With the re-introduction of hybrid designs, trolleybuses are no longer tied to overhead wires. The Public Service Company of New Jersey, with Yellow Coach, developed "All Service Vehicles;" trackless trolleys capable of operating as gas-electric buses when off wire, and used them successfully between 1935 and 1948. 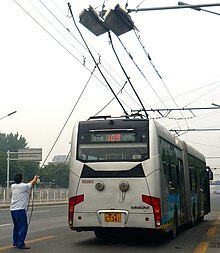 Since the 1980s, systems such as Muni in San Francisco, TransLink in Vancouver, and Beijing, among others, have bought trolleybuses equipped with batteries to allow them to operate fairly long distances away from the wires. Supercapacitors can be also used to move buses short distances. Trolleybuses can optionally be equipped either with limited off-wire capability—a small diesel engine or battery pack—for auxiliary or emergency use only, or full dual-mode capability. A simple auxiliary power unit can allow a trolleybus to get around a route blockage or can reduce the amount (or complexity) of overhead wiring needed at operating garages (depots). This capability has become increasingly common in newer trolleybuses, particularly in North America and Europe, where the vast majority of new trolleybuses delivered since the 1990s are fitted with at least limited off-wire capability. These have gradually replaced older trolleybuses which lacked such capability. In Philadelphia, new trackless trolleys equipped with small hybrid diesel-electric power units for operating short distances off-wire were placed in service by SEPTA in 2008. This is instead of the trolleys using a conventional diesel drive train or battery-only system for their off-wire movement. King County Metro in Seattle, Washington and the MBTA in Boston use or have used dual-mode buses that run on electric power from overhead wires on a fixed right-of-way and on diesel power on city streets. Metro used special-order articulated Breda buses with the center axle driven electrically and the rear (third) axle driven by a conventional power pack, with electricity used for clean operation in the downtown transit tunnel. They were introduced in 1990 and retired in 2005, replaced by cleaner hybrid buses, although 59 of 236 had their diesel propulsion equipment removed and continue (as of 2010) in trolley bus service on non-tunnel routes. Since 2004, the MBTA uses dual-mode buses on its Silver Line (Waterfront) route. With increasing diesel fuel costs and problems caused by particulate matter and NOx emissions in cities, trolleybuses can be an attractive alternative, either as the primary transit mode or as a supplement to rapid transit and commuter rail networks. Trolleybuses are quieter than internal combustion engine vehicles. Mainly a benefit, it also provides much less warning of a trolleybus's approach. A speaker attached to the front of the vehicle can raise the noise to a desired "safe" level. This noise can be directed to pedestrians in front of the vehicle, as opposed to motor noise which typically comes from the rear of a bus and is more noticeable to bystanders than to pedestrians. Trolleybuses can share overhead wires and other electrical infrastructure (such as substations) with tramways. This can result in cost savings when trolleybuses are added to a transport system that already has trams, though this refers only to potential savings over the cost of installing and operating trolleybuses alone. Three common types of switches exist: power-on/power-off (the picture of a switch above is of this type), Selectric, and Fahslabend. 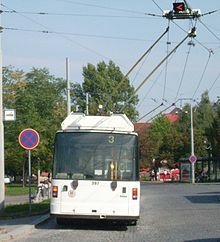 A power-on/power-off switch is triggered if the trolleybus is drawing considerable power from the overhead wires, usually by accelerating, at the moment the poles pass over the contacts. (The contacts are lined up on the wires in this case.) If the trolleybus "coasts" through the switch, the switch will not activate. Some trolleybuses, such as those in Philadelphia and Vancouver, have a manual "power-coast" toggle switch that turns the power on or off. This allows a switch to be triggered in situations that would otherwise be impossible, such as activating a switch while braking or accelerating through a switch without activating it. One variation of the toggle switch will simulate accelerating by causing a larger power draw (through a resistance grid), but will not simulate coasting and prevent activation of the switch by cutting the power. A Selectric switch has a similar design, but the contacts on the wires are skewed, often at a 45-degree angle, rather than being lined up. This skew means that a trolleybus going straight through will not trigger the switch, but a trolleybus making a turn will have its poles match the contacts in a matching skew (with one pole shoe ahead of the other), which will trigger the switch regardless of power draw (accelerating versus coasting). For a Fahslabend switch, the trolleybus' turn indicator control (or a separate driver-controlled switch) causes a coded radio signal to be sent from a transmitter, often attached to a trolley pole. The receiver is attached to the switch and causes it to trigger if the correct code is received. This has the advantage that the driver does not need to be accelerating the bus (as with a power-on/power-off switch) or trying to make a sharp turn (as with a Selectric switch). Trailing switches (where two sets of wires merge) do not require action by the operator. The frog runners are pushed into the desired position by the trolley shoe, or the frog is shaped so the shoe is guided onto the exit wire without any moving parts. A ZiU-9 trolleybus in service in Piraeus, Greece, on the large Athens-area trolleybus system. The Russian-built ZiU-9 (also known as the ZiU-682), introduced in 1972, is the most numerous trolleybus model in history, with more than 45,000 built. :114 In the 2000s it was effectively rendered obsolete by low-floor designs. Well over 200 different trolleybus makers have existed – mostly commercial manufacturers, but in some cases (particularly in communist countries), built by the publicly owned operating companies or authorities. :91–125 Of the defunct or former trolleybus manufacturers, the largest producers – ones whose production totalled more than 1,000 units each – included the U.S. companies Brill (approx. 3,250 total), Pullman-Standard (2,007), and Marmon-Herrington (1,624); the English companies AEC (approx. 1,750), British United Traction (BUT) (1,573), Leyland (1,420) and Sunbeam (1,379); France's Vétra (more than 1,750); and the Italian builders Alfa Romeo (2,044) and Fiat (approx. 1,700). Also, Canadian Car and Foundry built 1,114 trolleybuses based on designs by Brill. A significant change to trolleybus designs starting in the early 1990s was the introduction of low-floor models, which began only a few years after the first such models were introduced for motorbuses. These have gradually replaced high-floor designs, and by 2012, every existing trolleybus system in Western Europe had purchased low-floor trolleybuses, with the La Spezia (Italy) system being the last one to do so, and several systems in other parts of the world have purchased low-floor vehicles. Trolleybuses in other countries continued to lack disabled access until the 1990s, when the first two low-floor trolleybus models were introduced, both built in 1991, a "Swisstrolley" demonstrator built by Switzerland's NAW/Hess and an N6020 demonstrator built by Neoplan. The first production-series low-floor trolleybuses were built in 1992: 13 by NAW for the Geneva system and 10 Gräf & Stift for the Innsbruck system [de]. By 1995, such vehicles were also being made by several other European manufacturers, including Skoda, Breda, Ikarus and Van Hool. The first Solaris "Trollino" made its debut in early 2001.:30 In the former Soviet Union countries, Belarus' Belkommunmash built its first low-floor trolleybus (model AKSM-333) in 1999, and other manufacturers in the former Soviet countries joined the trend in the early 2000s. However, because the lifespan of a trolleybus is typically longer than that of a motorbus, the budget allocation and purchase typically factored in the longevity; the introduction of low-floor vehicles applied pressures on operators to retire high-floor trolleybuses that were only a few years old and replace them with low-floor trolleybuses. Responses varied, with some systems keeping their high-floor fleets, and others retiring them early but, in many instances, selling them secondhand for continued use in countries where there was a demand for low-cost secondhand trolleybuses, in particular in Romania and Bulgaria. The Lausanne system dealt with this dilemma in the 1990s by purchasing new low-floor passenger trailers to be towed by its high-floor trolleybuses, a choice later also made by Lucerne. Outside Europe, 14 vehicles built by, and for, the Shanghai trolleybus system in mid-1999 were the first reported low-floor trolleybuses in Southeast Asia. Wellington, New Zealand, took delivery of its first low-floor trolleybus in March 2003, and by the end of 2009 had renewed its entire fleet with such vehicles. Unlike Europe, where low floor means "100%" low floor from front to back, most "low floor" buses on other continents are actually only low-entry or part-low floor. With regard to non-passenger aspects of vehicle design, the transition from high-floor to low-floor has meant that some equipment previously placed under the floor has been moved to the roof. Some transit operators have needed to modify their maintenance facilities to accommodate this change, a one-time expense. Since the end of 1997, no double-decker trolleybuses have been in service anywhere in the world, but in the past several manufacturers made such vehicles. Most builders of double-deck trolleybuses were in the United Kingdom, but there were a few, usually solitary, instances of such trolleybuses being built in other countries, including in Germany by Henschel (for Hamburg); in Italy by Lancia (for Porto, Portugal); in Russia by the Yaroslavl motor plant (for Moscow) and in Spain by Maquitrans (for Barcelona). British manufacturers of double-deck trolleybuses included AEC, BUT, Crossley, Guy, Leyland, Karrier, Sunbeam and others. In 2001, Citybus (Hong Kong) converted a Dennis Dragon (#701) into a double-decker trolleybus, and it was tested on a 300-metre track in Wong Chuk Hang in that year. Hong Kong decided not to build a trolleybus system, and the testing of this prototype did not lead to any further production of vehicles. There are currently 300 cities or metropolitan areas where trolleybuses are operated, and more than 500 additional trolleybus systems have existed in the past. For an overview, by country, see Trolleybus usage by country, and for complete lists of trolleybus systems by location, with dates of opening and (where applicable) closure, see List of trolleybus systems and the related lists indexed there. Of the systems existing as of 2012, the majority are located in Europe and Asia, including 85 in Russia and 43 in Ukraine. However, there are eight systems existing in North America and nine in South America. Trolleybuses have been preserved in most of the countries where they have operated. The United Kingdom has the largest number of preserved trolleybuses with more than 110, while the United States has around 70. Most preserved vehicles are on static display only, but a few museums are equipped with a trolleybus line, allowing trolleybuses to operate for visitors. Museums with operational trolleybus routes include three in the UK – the Trolleybus Museum at Sandtoft, the East Anglia Transport Museum and the Black Country Living Museum – and three in the United States – the Illinois Railway Museum, the Seashore Trolley Museum and the Shore Line Trolley Museum – but operation of trolleybuses does not necessarily occur on a regular schedule of dates at these museums. ^ Joyce, J.; King, J. S.; and Newman, A. G. (1986). British Trolleybus Systems, pp. 9, 12. London: Ian Allan Publishing. ISBN 0-7110-1647-X. ^ Dunbar, Charles S. (1967). Buses, Trolleys & Trams. Paul Hamlyn Ltd. (UK). Republished 2004 with ISBN 0-7537-0970-8 or 9780753709702. ^ "Trolley service begins the next 60 years" (Press release). TransLink. August 16, 2008. Archived from the original on 1 February 2014. Retrieved 6 September 2012. ^ a b c d e Webb, Mary (ed.) (2012). Jane's Urban Transport Systems 2012–2013, pp. "" and "" (in foreword). Coulsdon, Surrey (UK): Jane's Information Group. ISBN 978-0-7106-2994-4. ^ a b c d e f g h i Murray, Alan (2000). World Trolleybus Encyclopaedia. Yateley, Hampshire, UK: Trolleybooks. ISBN 0-904235-18-1. ^ a b Ashley Bruce, Lombard-Gerin and Inventing the Trolleybus (Trolleybooks, 2017, ISBN 978-0-904235-25-8), p. 88 et seq. ^ a b Charles S. Dunbar, Buses, Trolleys and Trams (Paul Hamlyn Ltd, 1967, no ISBN), p. 81 et seq. ^ Henry Martin, Lignes Aeriennes et Trolleys pour Automobile sur Route (Libraire Polytechnique Ch., 1902, no ISBN), p. 29 et seq. ^ J. S. King, Keighley Corporation Transport, (Advertiser Press Ltd, 1964, no ISBN) p. 39 et seq. ^ "Plan for city trolleybus comeback". BBC News. 15 June 2007. Retrieved 2009-06-03. ^ Trolleybus Magazine No. 321 (May–June 2015), p. 90. ^ G. Cebrat. "Greenfleet". Greenfleet.info. Archived from the original on 2006-02-12. Retrieved 2010-11-29. ^ "Power in downtown Vancouver won't be fully restored until Tuesday". CBC News. 14 July 2008. Other reports stated that the (electrical) explosion did not affect power supply to the trolleybuses (only implied by this article). ^ Ashley Bruce. "Overhead". Tbus.org.uk. Retrieved 2010-11-29. ^ "Electric Trolley Bus Fact Sheet" (PDF). Seattle Department of Transportation. Archived from the original (PDF) on 2017-02-17. Retrieved 2012-03-29. ^ Trolleybus Magazine No. 267 (May–June 2006), p. 71. National Trolleybus Assn. (UK). ^ a b Electric Vehicle Technologies at the Wayback Machine (archived March 3, 2006). Transport 2000 BC. Archived from the original on 2006-03-03. ^ Trademark of Ohio Brass Co., maker of trolley wire fittings and equipment and trolley poles. The typewriter from IBM bearing that name had not been invented yet. ^ a b Trolleybus Magazine No. 311 (September–October 2013). ^ Trolleybus Magazine No. 305 (September–October 2012), p. 119. ^ a b "Getting on board" (July–August 1993). Trolleybus Magazine No. 190, pp. 86–87. National Trolleybus Association (UK). ^ DeArmond, R. C. (May–June 1985). "The Trolleybus System of Dayton, part 2". Trolleybus Magazine No. 141, pp. 49–64. ^ Trolleybus Magazine No. 179 (September–October 1991), pp. 100–101. ^ "The Neoplan N6020 Low-Floor Trolleybus". Trolleybus Magazine No. 183 (May–June 1992), p. 68. ^ Braddock, Andrew (March–April 1995). "Low-floor Trolleybuses – Making Access Easier". Trolleybus Magazine No. 200, pp. 30–37. ^ Turzanski, Bohdan (March–April 2012). "Trollino 500, Part 1". Trolleybus Magazine No. 302, pp. 28–35. ^ Trolleybus Magazine No. 226 (July–August 1999), p. 89. ^ a b c "Low-floor or Long Life?" (November–December 1998). Trolleybus Magazine No. 222, p. 122. National Trolleybus Association (UK). ^ Trolleybus Magazine No. 230 (March–April 2000), p. 39. ^ Trolleybus Magazine No. 249 (May–June 2003), p. 39. ^ Bramley, Rod (November–December 2012). "New Zealand: A 'Roller Coaster' Ride, Part 4". Trolleybus Magazine No. 306, pp. 126–134. ^ a b Box, Roland (July–August 2010). "More about the 2000s". Trolleybus Magazine No. 292, pp. 78–82. National Trolleybus Association (UK). ISSN 0266-7452. ^ a b Trolleybus Magazine No. 238 (July–August 2001), pp. 73 and 88. ^ Isgar, Carl F. (January–February 2011). "Preservation Update". Trolleybus Magazine No. 295, p. 11. National Trolleybus Association (UK). ISSN 0266-7452. Wikimedia Commons has media related to Trolleybus.